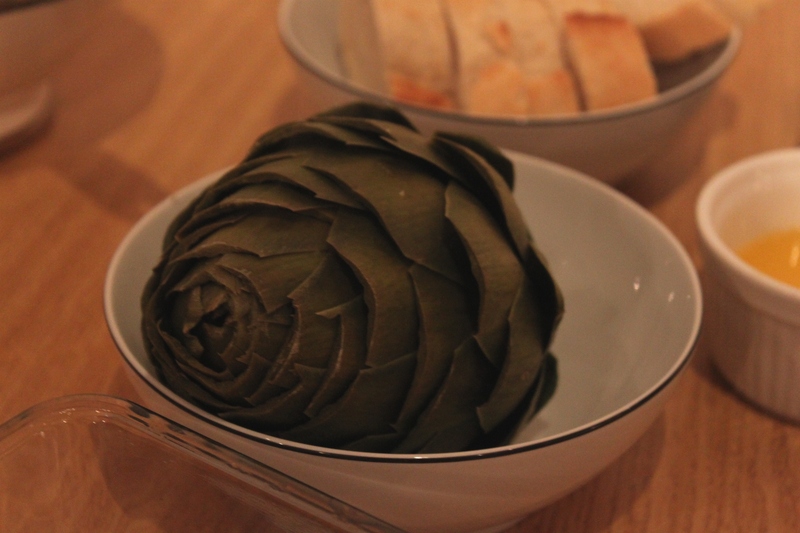 Globe artichoke – the perfect nibble? Sometimes I really admire the ability the Mediterranean countries have to dress up vegetables in the most simplest way and make it taste delicious. When Maria & Daniel were here in April we had artichokes the simple French way and it was both good fun to pick it apart and fabulous to eat. I served it with melted butter, wild garlic mayo and baguette. Amazing! Depending on the size, use approx 1/2 artichoke per person as a nibble/small starter. Trim the leaves with scissors all around the artichoke and rub with lemon over the cuts so they won’t go brown. Place the artichoke in salted boiling water and cook until soft (20-45 minutes depending on size). Start to eat it by picking the leaves from the bottom and up, outside and in. Dip in butter or mayo and scrape off the ‘meaty’ part with your teeth. Once the leaves are picked the heart remains. Trim away all the fluff and cut it up, serve with a knife and fork.